Does Scalp Pigmentation Look Real? A relatively recent hair replacement treatment has gained popularity over the last decade. Head Tattoos, or Micro Scalp Pigmentation. Also known by other names is a cosmetic treatment that applies ink to the skin. The ink or pigment is applied to the skin to change or darken the skins natural complexion. Unlike body art tattoo, scalp pigmentation (SMP) is not permanent. Inks can last anywhere between a year and three years or so. The pigment is applied to the dermal layer of the skin. As a result will naturally fade over time. SMP has become an alternative way to hide hair loss for male pattern baldness sufferers and can also treat unsightly scarring and alternative hair loss causes such as traction alopecia, diffused thinning and alopecia areata cases. Like any cosmetic technique, it requires skill and expertise. To make the ink appear to be natural and design a hairline that matches the individual´s facial bone structure. The concept behind SMP is by adding the pigment to the skin it blocks the skins natural complexion To resemble shaved hairs from a new hairline to the crown if required. By keeping the surrounding hair shaved. It is possible to create the look of a good, full head of hair, merely shaved. The initial applications of the pigment will fade. But subsequent sessions will build up the pigment. This will ensure a solid result is eventually achieved. The pigment, again, is unlike conventional body art. It is not coloured but a single contrast. That can vary in tone from lighter to darker contrast. This is because it is not necessary to match the hair colour. But to create the illusion of fullness and density. Care needs to be taken when designing the hairline. To match the individual´s bone structure. To create a look that looks natural rather than man-made like a designer type hairline styles. Full coverage can be achieved in the initial session. Scalp Micro Pigmentation can also be used on long hair. When the person has suffered from thinning over the top or sides of the scalp. Known as diffused hair loss or DUPA. Although there is full hair coverage the scalp is visible through the thinning hair. By applying the pigment between the hairs adds the look of hair density and fullness. Alopecia Areata is a chronic hair loss condition. That can affect any area of the body, including the scalp. The result is patchy hair loss. This can expand to a total loss of hair in severe cases. SMP can rebuild the look over the entire scalp. Rebuilding hairlines as well as around the back and sides of the head. To give the look of a full shaved head of hair. Without damaging the existing hair from regrowing at any time. SMP is a non-surgical cosmetic treatment. It can be used along with a hair transplant and other hair loss treatments. Such as minoxidil and finasteride. When the pigment fades a touch-up treatment will be required to rebuild the look. These are normally charged on an hourly basis but vary by provider. The procedure takes roughly three to five hours. Depending on the size of the area. It can be applied with no numbing agents. Scalp Pigmentation can help those that do not like the idea of a surgical hair transplant procedure or maybe they are not a good candidate. Ensure you receive a comprehensive consultation before committing to any hair treatment. Just because SMP is non-surgical it will have a cosmetic impact on your look and it is important that the instruments used, the quality of the pigment and the technician performing the treatment are of the highest quality. Aspects to look out for is the hairline designs the technician creates and the contrast of the pigment, whether too dark, patchy or does not blend with the surrounding hair. 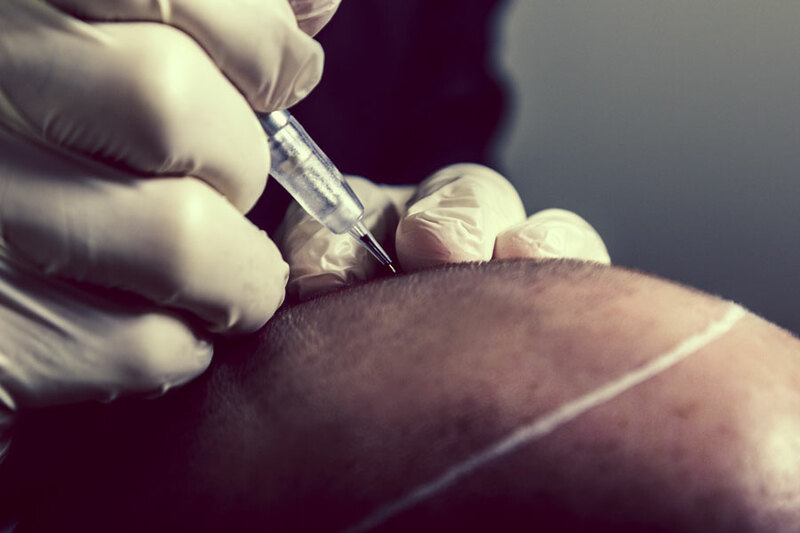 The pigment can be removed but it is not a simple or pain-free process so it is important to ensure you choose an experienced and high-quality Technician to perform your scalp pigmentation treatment.